In short, my trip was amazing. I tried to capture much of it on Facebook as I went along so that I'd remember. Next time, I think I want to do something a bit more robust. A trip journal, perhaps. We'll see how it goes. What I know is that this blog has taken me forever to put together because I haven't found exactly the right software to use. Suggestions are welcome for my next trip. Until then, enjoy the itinerary and if you have questions, I LOOOOOVE talking about this, so just email me. Arrive SFO, take the BART to my apartment in Nobb Hill, a short walk away from where the conference would be held. And a fraction of the cost of the conference hotel, by the way. Since I arrived around 2pm (Pacific Time -- having left YYZ at noon), albeit without my luggage (sigh), it left me with lots of time to explore the area. I walked up to North Beach where they were having a street festival that was shutting down, but I saw Coit Tower, which some people walk up for the view (I didn't), and the interesting, packed streets and shops including Brioche Bakery for a light meal (good food, terrible coffee; I'd recommend baked goods there and eating a meal at Comstock instead). As sunset approached, I walked to (and up) Ina Coolbrith Park. The park, in true SF-stylz, is pretty much vertical. All stairs. At the top is the best view of SF that I found. The walk up there is all part of the awesome. On the way, you'll pass over a road that falls off into nothingness on both sides. I would NOT want to drive on these hills -- terrifying! San Franciso's neighbourhoods are worth getting to know for all their different personalities. And the only way to do it, in my opinion, is to walk them. After a breakfast at Reveille Coffee (second-favourite coffee in SF, delicious almond croissant) I shopped for items that I needed in order to go to a professional event (delayed luggage still hadn't arrived) in Union Square. Dropping purchases off in my nearby Nobb Hill apartment, I walked everywhere, starting along Powell St, heading west, I found an art show in super cute little park, Huntington Park, right across the street from Grace Cathedral. I had to check out Bob's Donuts because I'm me, but I certainly didn't have to buy and eat a 1/2 dozen as I walked... or did I? At just $1 each, and many of them fresh from the over (that's the trick to ordering there -- just buy whatever's fresh), they just kept popping into my mouth as I walked down Polk St. 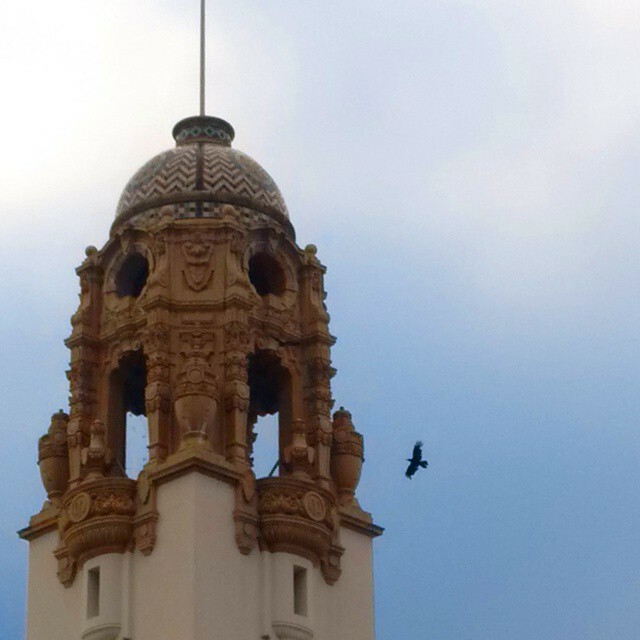 Probably a good thing, as it kept my mind from focussing too hard on the down-trodden nature of the Tenderloin. Such a weird spot: smack in the middle of perfectly wonderful, safe, upscale neighbourhoods. Bordering the Civic Centre, with stately City Hall, the Opera House, Symphony, War Memorial, the green space is filled with vagrants. So I was glad to be there during the day -- the buildings were certainly worthwhile, though I wished they were open so I could have a tour. Another time, perhaps. 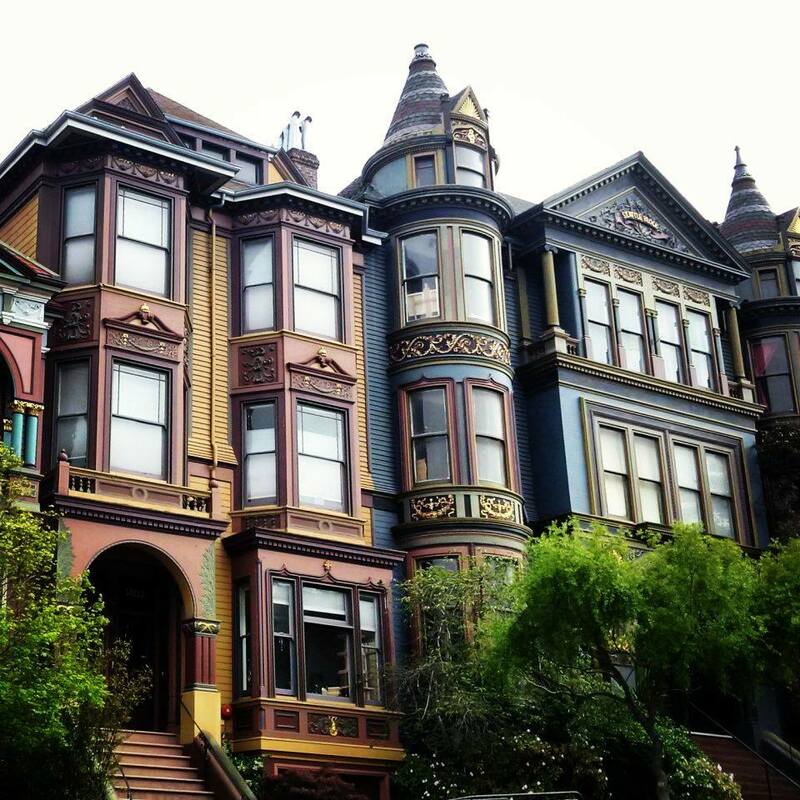 Painted ladies, North of Alamo Park along Steiner St. I discovered Smitten Ice Cream as a pop-up shop near Patricia's Green in Hayes Valley and had to try it as each serving of interesting flavour (mine was strawberry balsamic) is made just for you, using liquid nitrogen. Worth visiting this little neighbourhood -- so cute. Nice coffee shops, cafes and places with interesting, unique wares for souvenirs. 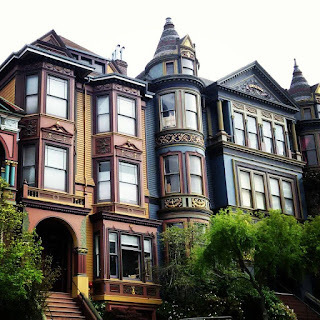 From there, I walked to Alamo Park which is known for an iconic view of the city including what they call the "Painted Ladies" -- the old Victorians that are seen in many pictures of San Francisco. Years ago, they were painted all crazy colours. Today, they're bland beige, blue, and white. Tastes change, but it was sad to see the authentic styles changed. However, there are places where you can still see the elaborately painted homes. I walked north to Japantown, which was super kitschy and interesting with the Ruth Asawa Fountain and Cottage Row (although missable if you had to make a choice). It was worth a quick look as walked further north to Pacific Heights. What a lovely, upscale neighbourhood. Beautiful shops, gorgeous homes, and a huge park. From there, I hoofed it back home over all the hills. Conference during the day; walking at night! This is the way I wish all my days would go. As soon as "work" was done, I hopped on the BART with my pass (really great article to explain their transport system here) and explored the Mission District. I first stopped at La Taqueria, because Lonely Planet told me that they had the best tacos in the city. Maybe they're the most authentic, I don't know. I thought it was good, but not the best I've had. Who knows if I really like authentic though? Still, it was well priced and the experience was authentic for the area: gritty with good food. 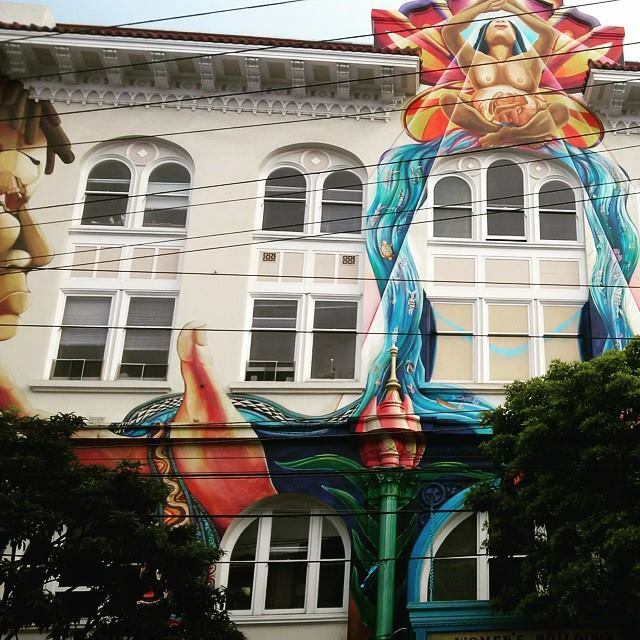 Walking around the Mission, you'll see lots of amazing murals. But be sure to inject a lot of food into the walking tour. Including ice cream. I started at Henry Slocombe and tried almost all of their flavours before settling on salted caramel with cocoa nibs and housemade fudge sauce. OMG. Plus, the girl who worked there was SO nice. 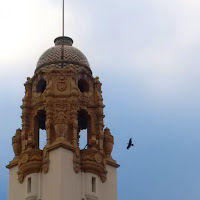 And there was a couple from the neighbourhood who came in who helped me map out the rest of my Mission walking tour so that I could take in more of the best of the Mission, including Bi-Rite ice cream. Wow. 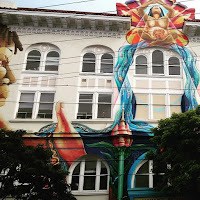 Enjoying my ice creams, I saw the Spanish-style buildings that the Mission is famous for, including Dolores Mission and this Mission high school. Gorgeous. Conference during the day. A bit more shopping while I waited for an evening networking activity. There are some fantastic discount shops around Union Square. DSW, Nordstrom's Rack, Sak's Off Fifth, Ross For Less, Marshall's, the list goes on. 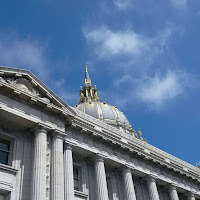 There are some excellent coffee shops, especially Blue Bottle Cafe at Mint Plaza (SoMa). The restaurants in that area aren't all that -- every time I've eaten in that area, it's been pretty mediocre. On this trip, I ate in other, more interesting, spots. Conference and then walking again. This time, I took the bus to Haight-Ashbury. 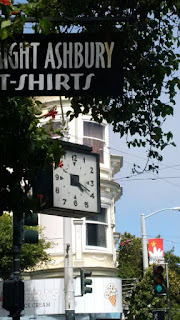 I started in Lower Haight (trying the Ice Cream at Three Twins -- not that great, honestly) and walked up Haight St. I stopped for lunch at a super yummy Mexican place called Little Chihuahua before continuing up the street, stopping at the little boutiques to try on dresses and look at the locally-made cards and jewelry. 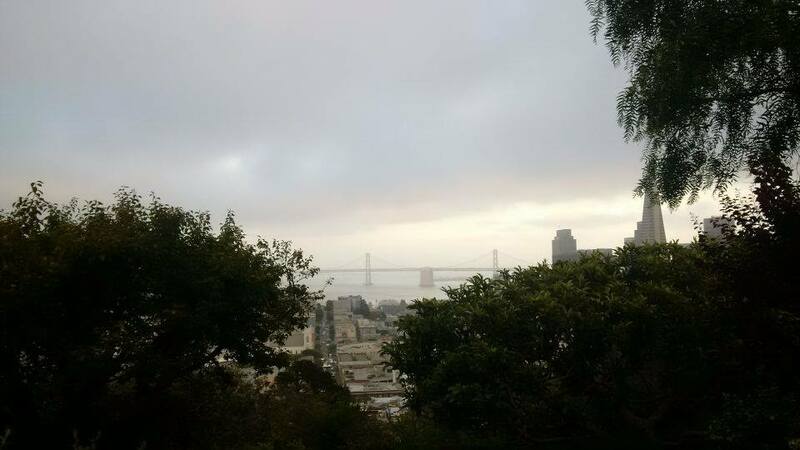 I explored Buena Vista Park, but it was skippable if you've been to other parts of the city with a view, which I had. I also tried Golden Gate Park, but maybe it was just the area from which I started: it was pretty sketchy. So I turned around and continued to shop at the second-hand and vintage shops. Amazing stuff there, so I bought a flower pin from a local artist. 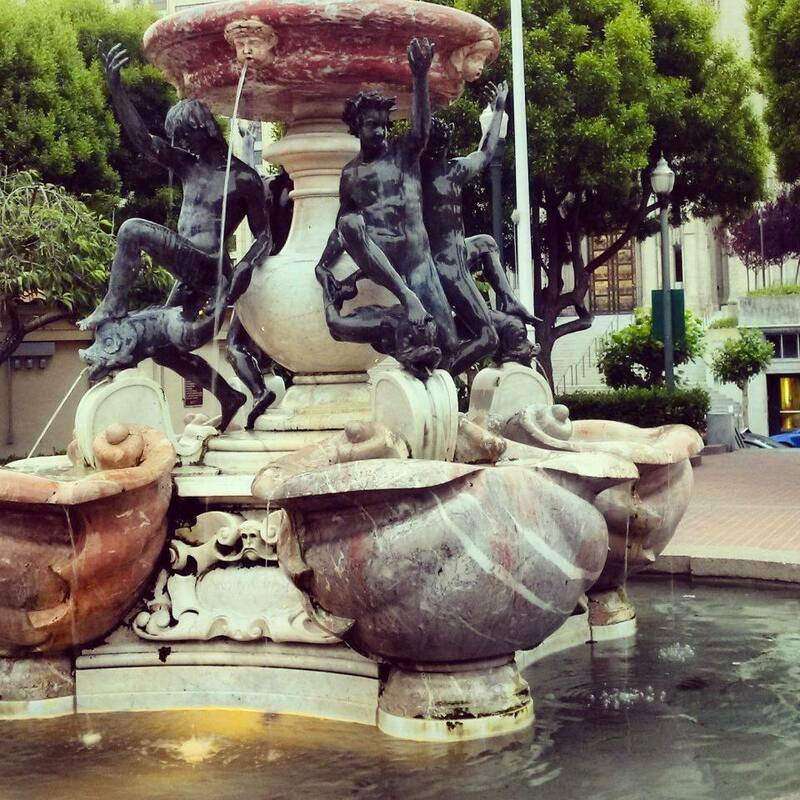 Pack, pick up the rental car at Avis Embarcadero. Not sure why, but it was the cheapest I could find, even looking at some outside the city accessible by public transport. 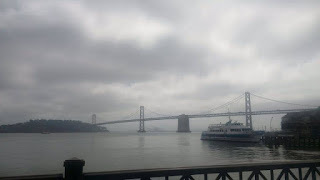 Since I was a bit early for my pick up and traffic was still a little hectic from the morning commute, I went to the Ferry building and had some more amazing Blue Bottle Coffee as well as a few baked goods from the bakery there. I wasn't super impressed by the bakery. 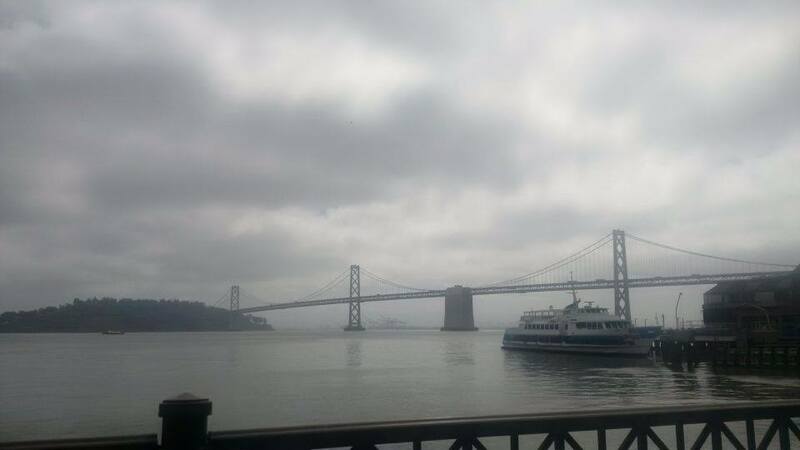 But it was a lovely spot to drink my coffee, looking over at the Bay Bridge, shrouded in mist/fog. The market outside the Ferry Building is worth it: I picked up some fruit there that was absolutely perfect. It took over 3 hours to drive to Yosemite. I stopped in Manteca for gas and groceries, but you could also stop in Oakdale. I passed a bunch of farmers markets that looked interesting, so I was sad that I'd already bought my fruit. It costs $30 for a weekly pass to the park which works for other parks as well, but I didn't use it beyond the two days I had planned. The drive itself was amazing and crazy. I wanted to stop and just look around at the breathtaking views, but sometimes there just wasn't anywhere to stop. And looking around would be dangerous (as the driver on hairpin turns all sorts of other large vehicles on the road). Given the road, my knowledge of them, and lack of copilot, I figured I needed to be at my inn before dark. That meant I only had a few hours to check out Yosemite by the time I got there, figured where I was in the park, and where to park. I checked in at the Visitor Centre and asked about which hike to do. The nice ranger suggested Bridal Veil Falls Trail since it was so close to the station and such a quick and easy one. And those are exactly the reasons that everyone else in the park does that one too. It was packed with kids, families, seniors, those in flip flops, those with baby carriages. It was nice and I'm glad I saw it, but it was a little annoying. I then drove back out to my hotel, "Yosemite Gold Lodge" in Coulterville. It's kind of far outside the park. 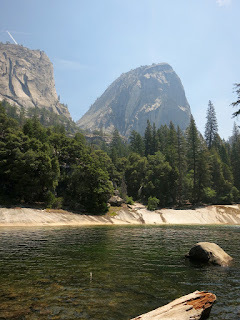 It was a pretty good price, and quiet, but I think next time I'd like to stay closer to Yosemite. Coulterville was a kind of cute western-style town with a general store and a little diner and gas station. Today was the big hike day. I'd planned out everything pretty well: packed lunch, coffee and breakfast at the lodge. Arrive early at the visitor parking at Curry Village or Trailhead parking, just beyond that. Easy walk to the Yosemite Mist Trail. 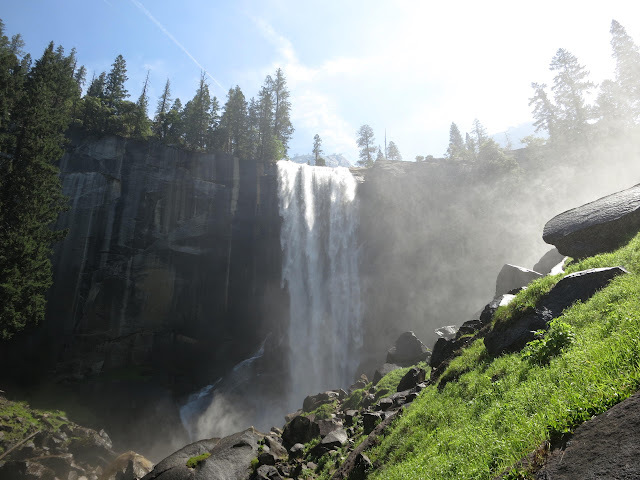 Then up to Vernal Falls and Nevada Falls. The first bit is easy. People with strollers, walkers, big people, babies, everyone can make the first part til you get to the last water and toilet station. 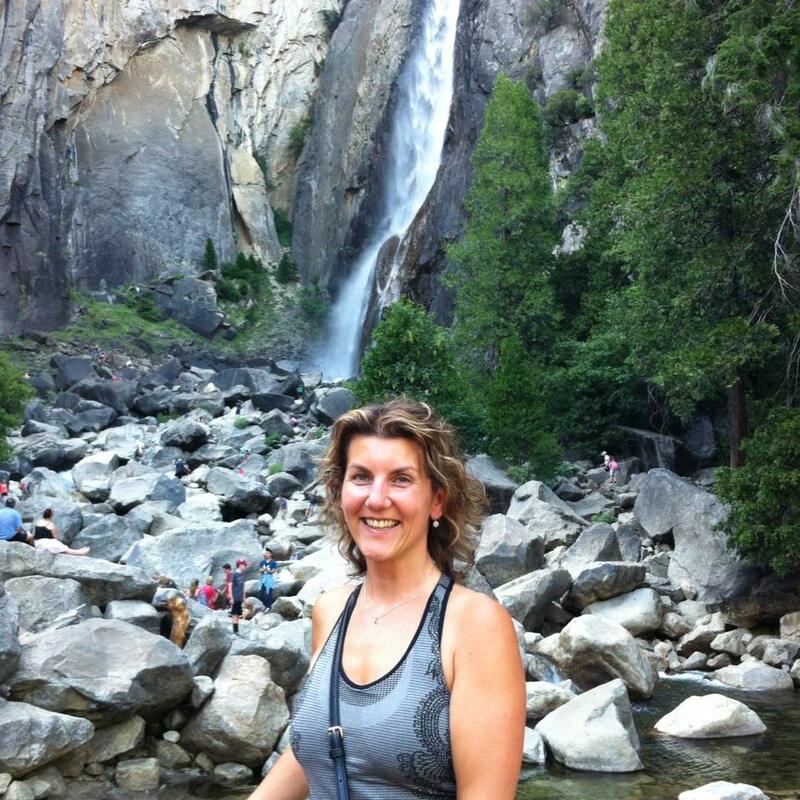 Vernal Falls isn't too bad but it's a lot of stairs. And people go all different speeds and take breaks so it can get a bit congested with people going up and down the same way. I went up and had my lunch there near the top of the falls. I was ready for the rest. 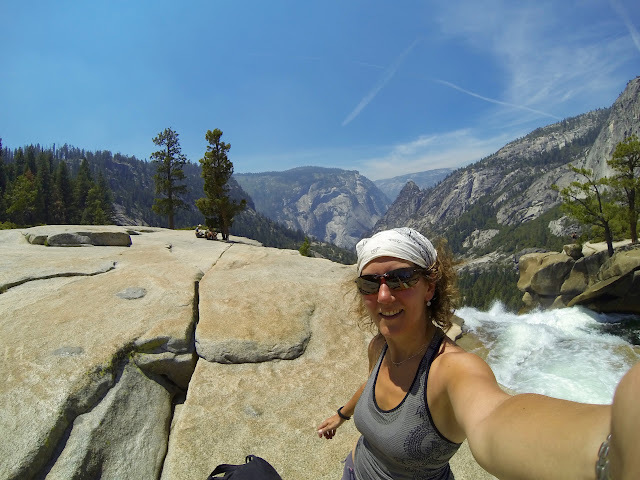 And since I'd sort of gotten turned around, I ended up on the trail going up to the next set of falls, Nevada Falls. 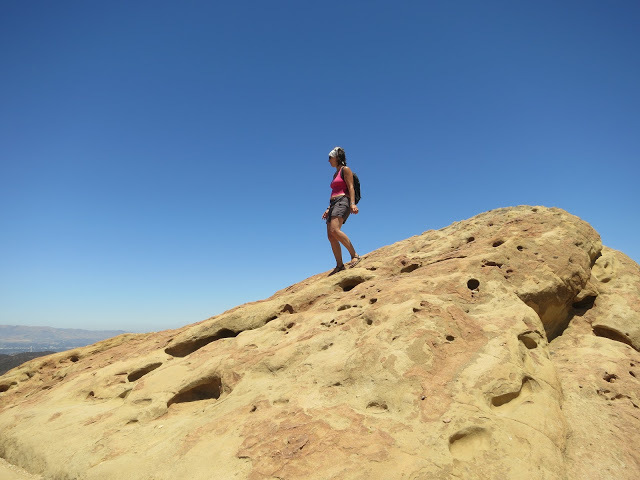 Someone asked if I was going all the way up and I bravely decided at that moment to do it. And they said, "GREAT! See ya up there!" I was certainly tired, even though I rested to take photos and drink water on the way up. But it was SO worth it! I can't even describe how beautiful it was and how great it felt to stick my feet in the freezing cold water up there at the top before it plunged over the edge. Exhilarating. Plus, I got to come down on the other side of the falls as a loop, instead of battling the crowds. Six hours later, I was tired and drinking water at the bottom. I actually ended up doing another hour hike to Mirror Lake (the hike I'd meant to do the day before), but it was so disappointing after the ridiculous high I'd been on, I could have skipped it. After another night in Coulterville, I headed back towards San Francisco. The drive took me past many roadside fruit stands, so of course I had to buy nectarines and apricots fresh from their farms. The I picked up Gordon at SFO. We started our road trip in earnest at Half Moon Bay. Mistake. We didn't see what the big deal was, honestly, and there was so much traffic! So we moved on south along Pacific Coast Highway 1. That's when the magic started. We pulled over at a random beach park and WHAM! Incredible gorgeousness. We stopped for dinner in Pescadero at Duarte's Tavern. Someone had recommended it to us. However, the directions were a bit sketch on where to turn off the highway, resulting in some slight discord. But it all worked out -- just had to turn on my roaming for a bit and it turned out we were on the right track. Pescadero was ADORABLE and Duarte's Tavern had really amazing artichoke and green chile soup. And their olallieberry pie was so amazing, I seriously wish I'd bought an entire pie. And eaten it myself. It's like a blueberry pie but better. Unfortunately, we didn't stay overnight in this area or in Santa Cruz, although we did drive through and Santa Cruz looked pretty kitschy cool. But it's not cheap either and we were on a schedule. So instead we drove to Watsonville, just outside of Monterey. It was a head of nothing good. The hotel was kind of like an older university residence. But it was just a place to sleep that was reasonably priced and offered free crappy breakfast. Not what I'd call "recommended". But it was certainly convenient and we didn't get bed bugs. We woke up early and drove to Monterey. Remember, we were on EST, so it was actually early. But we got to Monterey in plenty of time to check into our reserved room at the Martine Inn. I liked this place a lot. It was in the best possible location, right along the waterfront trail, but it was quiet and we even had street parking right in front of the hotel. Plus, it had loads of history and personality. It wasn't cheap, but Monterey really isn't cheap. It was reasonable for what we got, I think. That included free to-go coffees when we checked in, discounted Aquarium tickets, a short walk (with lots of seals to watch) along the beach to the Aquarium, free cocktail hour with snacks and drinks, free fruit and warm cookies pretty much all the time. Plus a great view. Thus, we were at the Aquarium when it opened. I'd read that if you don't do that, there are line-ups. Turned out to be true. We saw the sea otters get fed, right up close. I think it's the only time of day that could happen. It gets REALLY busy there! But I fell in love with the otters. We saw everything else you could imagine as well, including jellyfish and octopi which were eerily beautiful and Gordon's favourite. We had lunch at the nearby Sea Harvest which had the nicest, most polite 12-year-old waiter I've ever met. Plus, the fish was local, fresh, seriously amazing and NOT overpriced. We walked around Cannery Row, but it's really just a touristy shopping/eating area. Cute, but it didn't take long. 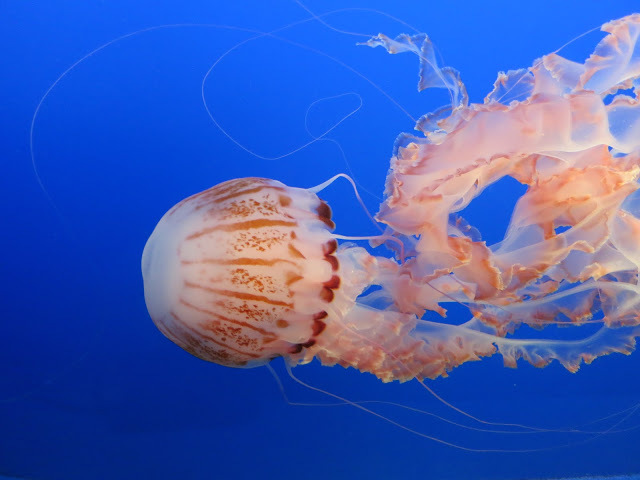 We went back to the aquarium before tiring of the crowds there and walking the waterfront trail to Lovers Point (meh) and Pacific Grove. Happily, I'd reserved at Pacific Grove's most amazing seafood restaurant, Passionfish. Very knowledgeable staff, delicious food, not pretentious, and though it wasn't cheap, it was good value for money, instead of paying too much for crap. We walked back to our Inn very happy. Time to move! We drove the 17-Mile Drive to see the Lone Cypress Tree and Pebble Beach (I wasn't impressed). But we also saw many sea lions at one of the stops, so that was pretty cool. Overall, I found the scenery here not better than the rest of the drive, so you could totally skip it. 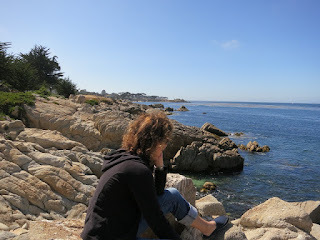 We stopped in Carmel, driving past the beach and having lunch in the town. It was a nice lunch but, although we walked around a bit there, it wasn't Gordon's thing at all. He didn't like it. I did a wine tasting there and then we were moving on. That was fine, as there was so much to see along the coast! On a recommendation from someone, we stopped at Rocky Point Restaurant for a drink. It was sort of unbelievable. 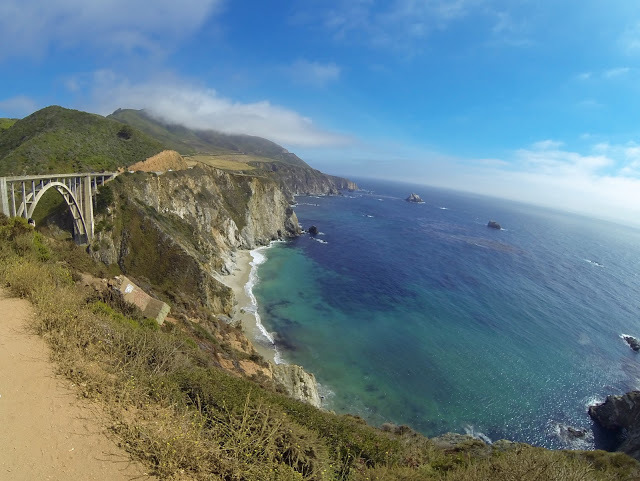 Further on was the iconic Bixby Creek Bridge. And then Big Sur... we walked to a beach and hung out for a bit, but it was quite windy and chilly, and it wasn't like we'd brought a picnic. Plus, Gordon was terrified that the tide would come in and trap us. It really didn't matter where we went, it was just gorgeous. I would have like to spend some time just sitting there and writing in my journal, soaking it in. But we had a schedule. 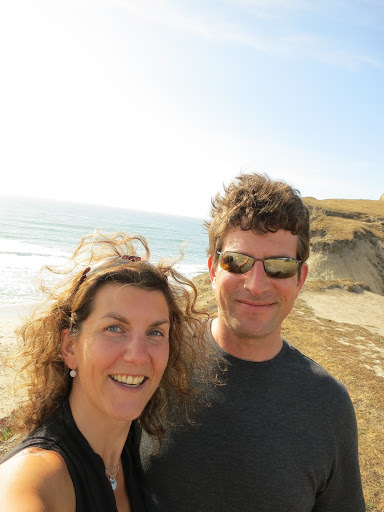 We stopped in Cambria for groceries before heading to our GORGEOUS cabin near Paso Robles. It wasn't cheap, but the spot was magnificent: a hilltop view of the rolling wine country, cozy designer furnishings, and completely silent and private. 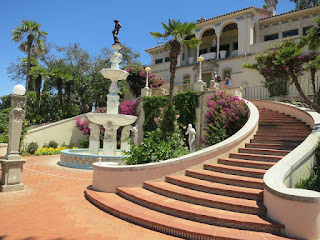 Since Gordon wasn't into wineries, we instead used the next day to head to Hearst Castle. I was skeptical, to be honest, but everyone goes there. No wonder. It's an amazing outdoor museum-house. The tour was wonderful. We stopped again in Cambria for lunch at a Mexican restaurant, Las Cambritas before heading down to Santa Barbara. It was really good - I had fish tacos and Gordon had some sort of fish dish that he liked, although they kind of screwed up his order but they were really nice about it. Funny thing is that they weren't allowed to give us tap water in the restaurant due to drought. But they sold us bottled water for $.50. We then drove to Santa Barbara and checked into our AirBnB spot. It was a bit of a weird spot, being just off of State St (which is the street where all the cool stuff is) but it's a long street, and it wasn't walking distance to the cool stuff. 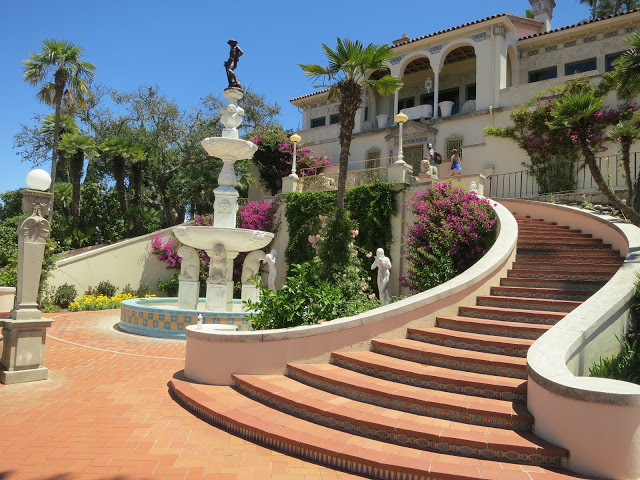 It's not cheap to stay in Santa Barbara, though, but I think we could have done better than we did by either finding a place in a location that was closer to more interesting stuff, or finding a cheaper place that was further out and driving to the "cool stuff". But we did find a really great Mexican place within walking distance to our place, called Los Agaves. It was a good price and the best Mexican we had on the whole trip. I totally recommend it. After a bit of a weird night in which the host's daughter sleep-walked into our room in the middle of the night, we got up and went out for breakfast. I loved it: Jeannine's kahlua french toast was amazing and their latte wasn't bad. Then we found a place to park in downtown Santa Barbara (it's mostly paid parking there, but they offer a certain amount of free parking for all -- I think it's the first hour). We walked to the County Courthouse and walked in to just look around. I happily found a docent walking tour and joined. Glad I did -- totally worth it! What a gorgeous building with some interesting history for the area! I really loved the "cool part" of Santa Barbara. They really took care to preserve the Spanish historical nature of the area in the architecture -- even the new buildings. 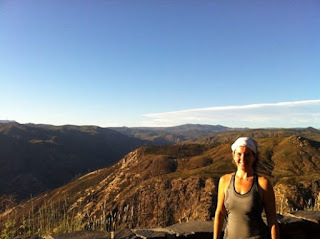 Then we drove to Topanga Canyon to check into our amazing cabin. We also managed to catch up with our friends who were getting married (the reason for this trip, really) and went for ice cream at Salt & Straw, which has crazy flavours -- I think I tried about five before settling. And why not? I'm paying a lot for that ice cream, I might as well be sure I like it first! Oddly, outside we then ran into the other people we know in the city, Wael and his fiance, Hannah. Was this set up?! They claim no, but how in the world did this coincidence happen in such a huge city? Neither party will fess up, so we continue to believe that the Universe is a magical place. Our host had helpfully provided a list of hiking options. 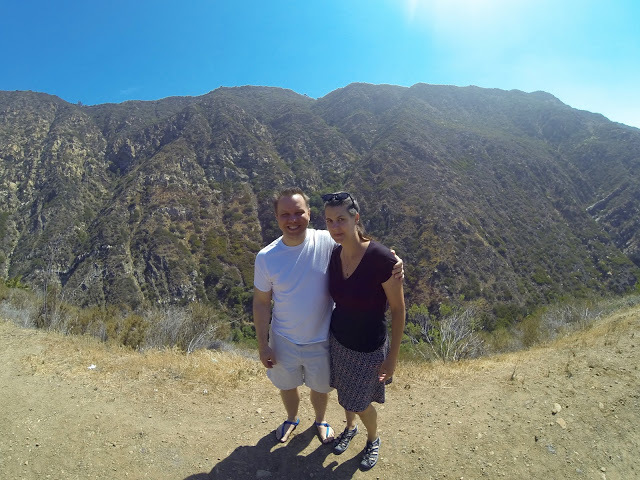 We decided to hike in Topanga Canyon, which was probably a 10-min drive from the cabin. We did the Eagle Rock trail (in/out, not the loop), which was somewhere around 4 miles through the desert. And it was pretty hot. The top part had awesome views of the surrounding area. After our hike, we drove back to our cabin, showered and drove to Santa Monica. We walked around part of the downtown (it's pretty extensive and we didn't have a map, so it was kind of random) to find somewhere to eat, finally settling on the Aussie Pie Kitchen. I had a butter chicken pie which was delicious! Then it was time to get back on the road to pick up our friends Anne and Chris at the airport. We'd chosen Santa Monica specifically because it's relatively close to LAX. Aside from much cursing about LA traffic and bad directions, we got to them OK and got back to the cabin for sleep. We drove to Malibu for breakfast at Marmalade Cafe. It was good, but not great. Then we went for a bit of a drive before heading back to the cabin to get ready for the big event. The wedding was at a Malibu mansion. It had gorgeous views, and lots of room for the families. They were blessed with lovely weather and everything in the ceremony was perfect. They then set a giant table in the backyard and served a multi-course delicious meal. Fires were lit as the sun went down and the temperatures dropped. Lovely. We met up with a friend from Gordon's lab, who's now at UCLA. We met at the Getty Mansion - he got us all free tickets, which was awesome. What an amazing spot! Rich people are crazy. 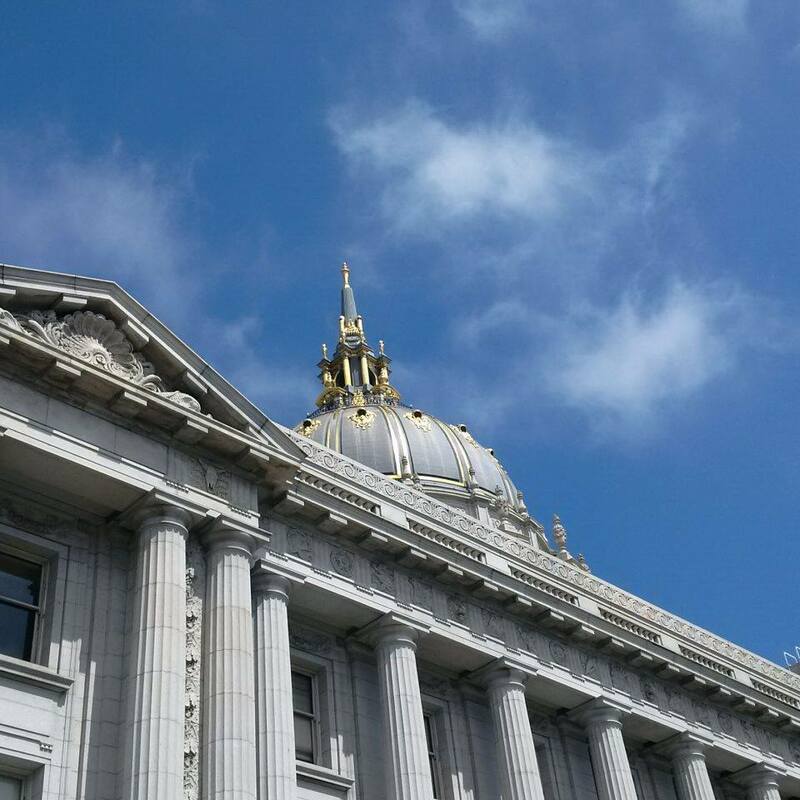 If you like architecture and art, this is a cool spot to go for the Greco-Roman style. I could have spent way longer here, even though it's not quite as awesome as Hearst Castle. Then we went for lunch in Santa Monica at a seafood/poke spot (Hawaiian version of sushi) - although it was good, there are SO many amazing places to eat there and they change all the time, so we usually just look it up on Yelp and TripAdvisor. After that, we did a bit of a driving tour of the Things To See in LA: Rodeo Drive, Beverly Hills, was first. So opulent, but quite small, requiring only an hour to wander around and get a feel for the place. We weren't there for the shopping -- we just ate ice cream/cupcake sundaes at Sprinkles where the cupcake craze was born (though I think I'd also like to try Ice Cream Lab). Next was Hollywood (bit of a dump/tourist trap similar to parts of Niagara Falls, but drive past it and it's great to say you've seen it). 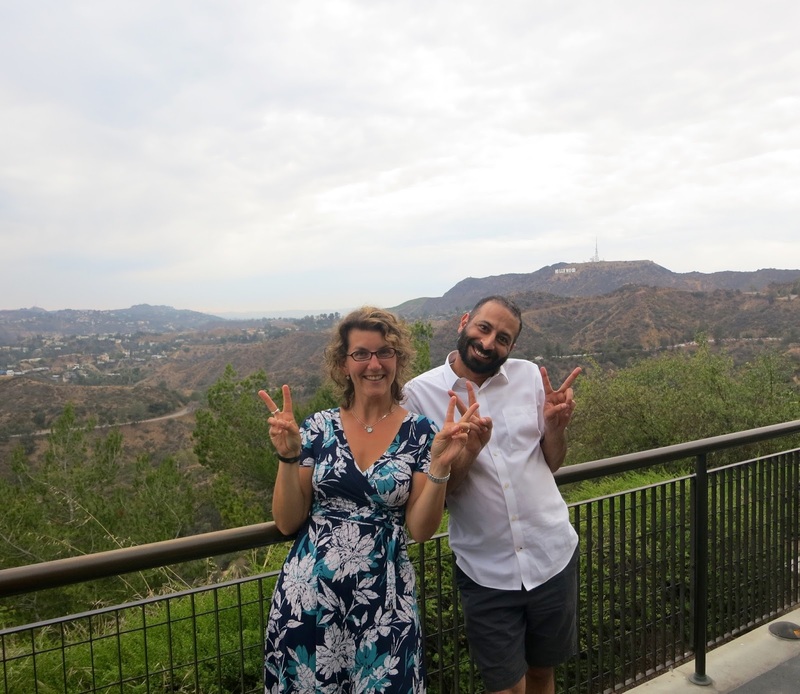 We finished at the Griffith Observatory. It was SO crazy busy, there were cars lined up everywhere! However, going at sunset is totally key -- I guess everyone else knew that too. I could have spent much more time here as well as it had lots of interesting exhibits about astronomy and the history of the the human race in general. The sunset was spectacular thanks to the smog, I understand. From there, you can also see the Hollywood sign on the side of the hill, together with the sunset. Don't readjust your sleeping patterns too much: it's really great to get up super early before the rest of the tourists are up and crammed into your hiking spot or normally-crammed tourist spot. When you get home, the aforementioned jet lag will be way less of a problem as well.